Halloween is coming in a month and it is time for another knitting pattern. This year my little guy is going to be a stag for Halloween and I designed this cute little hat for his costume. I now have two hat sizes available, but if either hat size doesn't work for your needs, you could always use a different hat pattern and just add the ears and antlers for your hat. Medium: circumference 19 inches [all medium instructions will follow the small instructions in brackets ( ) ]. With main colour, cast on 48 st (56st) on dpn's. Join in the round, being careful not to twist stitches. Continue for 3 (5) more rows. Next row: k around and repeat until hat measures 3.5inches (4.5inches) from the start. last row: k2tog, repeat around circle (k one). Cut yarn, weave through remaining stitches, pull tight, bind off and weave in ends. row 15, k2, bind off, weave in top end, but leave a long tail at the bottom (to sew the ear onto the hat). Bind off. Weave in one end and use the other end to sew inner ear centred onto outer ear. In cc1, cast on 9 st evenly on 3, 5mm dpns. Knit in the round until it measures 1.5 inches from beginning. Place 3 st on one needle and set aside. Cast on 2 st on a fourth needle and continue knitting in the round (8 st on needles). After 3/4", k2, k2tog, k to end of the round. next row: k, moving 2 st onto 1 needle, 1 on the other. next row: k2tog, k1, bind off. Rejoin yarn where the 3 st are set aside. Cast on 2 st (5 st total) and knit in round for 1/2". k2tog, k3, k2tog, k3, k2tog, k1. Bind off. Sew up hole where new stitches are joined on. Pull bound off ends to the inside of the antler. If desired, add stuffing to the base of the antler and then sew onto the top of the hat. And that's it! Please let me know if you find any errors in the pattern and if you have any suggestions. I also love to hear from people who made the pattern and enjoyed it. 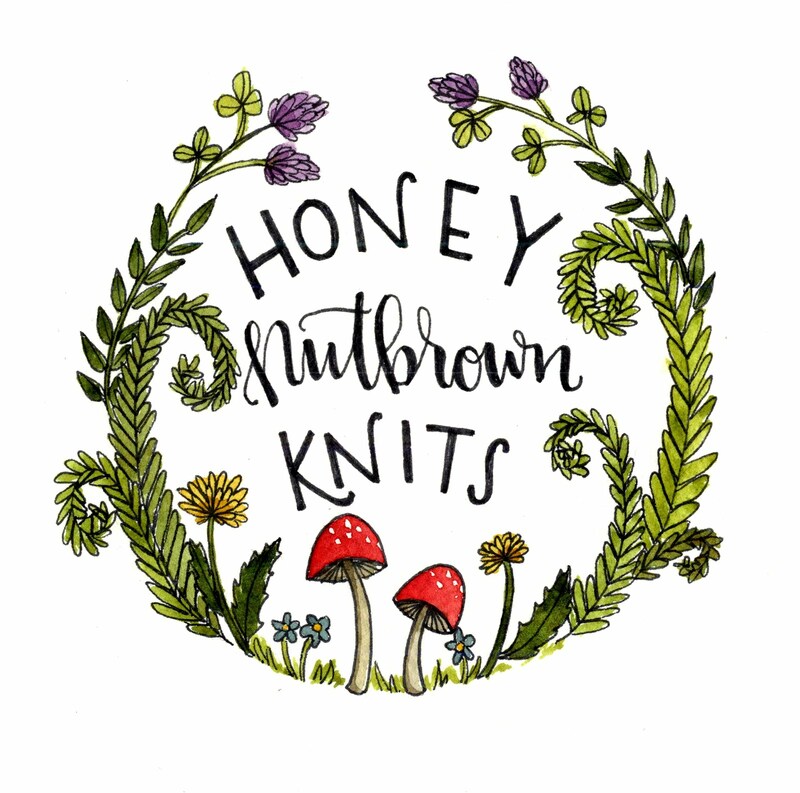 Please check out my other patterns on my blog and add me on raverly :honeynutbrown. Spectacular! I would wear that in a second! That's awesome! Do you allow us to sell finished pieces if we give you credit for the pattern? You are the best!!! Thanks Kris! Your little one looks so cute in that hat. Happy Halloween! Thanks for catching that, you are totally right! I have added the correction in italics and highlighted it. Hopefully it will work for you now! Sorry about that! Hi Emma. Hmmm, I'm not too sure what the problem is. I think the antlers may be a little twisted in the pattern. Do they look vastly different from the pictures? Are you on ravelry at all? If you look under the projects of the pattern, you can see a number of pictures that other people have posted of their version of this hat and maybe you can see a little closer up what the antlers looks like. Without seeing it in person, I have a hard time knowing what could be going wrong. I love to create and design my own crafts and projects. I collect hobbies. I love spending time in the forest and observing the natural world. I am a mother living in a small Northern village with my husband, my son, my daughter, my cat, and my chickens.